It’s not every day that you get the chance to work with such an iconic and world renowned beer brand such as Duvel. Brewed and based in our beloved Belgium, this was a unique chance to make our mark on a brand very close to our hearts. 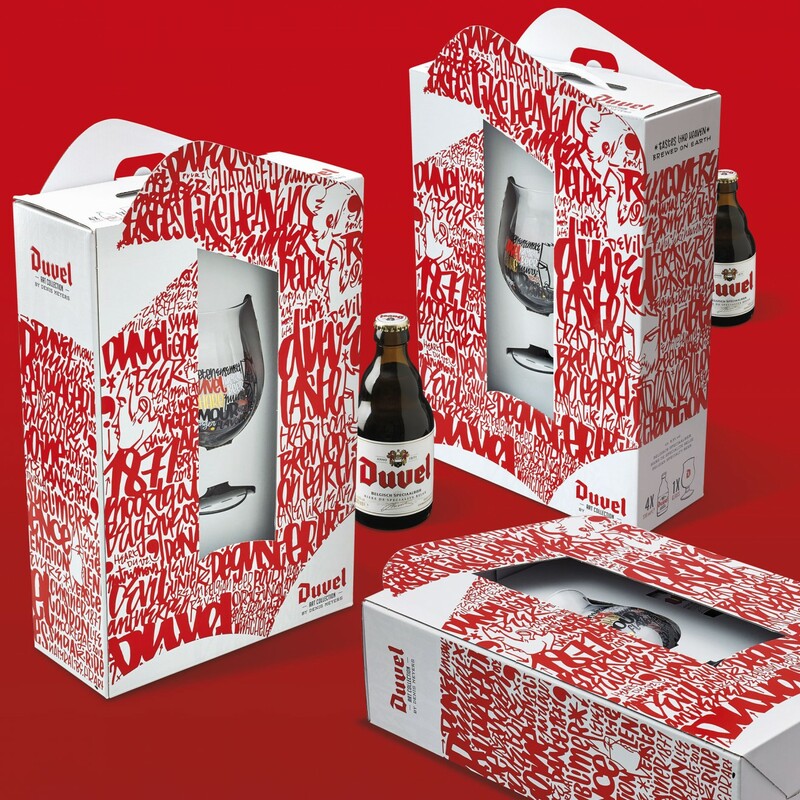 Our client at Duvel Moortgat looked to us to help guide and inspire them to new creative packaging solutions for their important gift-pack offerings. 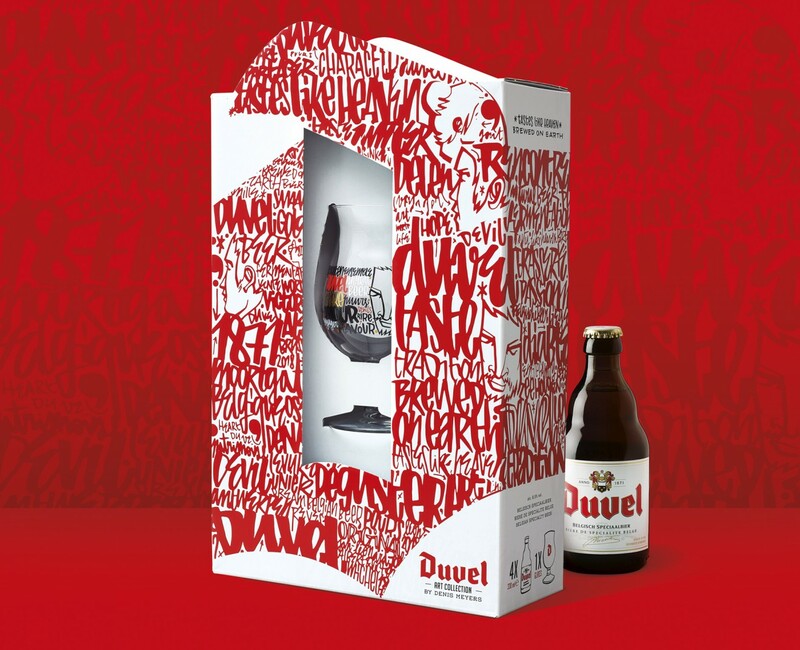 Combining 2 to 4 bottles of Duvel plus free beer glass within an attractive but robust carton gift-pack has proved limiting in the past from a creative point-of-view. Belgian supermarkets to international retail channels overseas look to this kind of offering to help stimulate a deeper relationship with the brand and its product, inviting consumers to buy as a gift for themselves or loved ones. 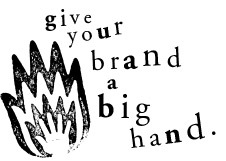 However as said, the market in our estimation had little to offer in the way of exciting stand-out creations, which therefore inspired us to push the boundaries in search of something really new. We observed that current retail packaging for our client was a little static and boring and lacked the real cutting edge and punch seen in their communication or off pack branding. This provided the motivation to make this new gift-pack more Duvel than ever before and really break the mold with tradition. In our eye’s the most iconic aspect of the Duvel brand was indeed its iconic ‘D’, which has been used as a branding device for many years now, from café signs to bottle caps, adoring the beer glass to multiple merchandise applications. And yet, never on pack, so this was our chance to make a statement. After multiple phases of internal 3D and design explorations, The Big ‘D’ pack was born. Together with the crucial knowledge and partnership of carton packaging specialists ‘Van Genechten’, a both show-stopping and robust pack was constructed, that solidly stacked 4 bottles together whilst creating a platform for the Big D to really rock those shelves. Going from horizontal to vertical bottle stacking proved challenging but provided a result not to be missed. Together with the central glass place within the ‘D’ the client decided to build further on this opportunity by using long-time collaborator and artist Denis Meyers to decorate our creation with his unique style Duvel limited edition consumers have become accustomed to. Do it Big or stay in Bed!